Revision total hip arthroplasty (THA) is associated with greater blood loss than primary THA. Jehovah’s Witnesses will not accept transfusions of blood or blood products and are thus at an increased risk for complications due to perioperative anemia. The purpose of this study was to report the clinical outcomes, radiographic outcomes, morbidity, and mortality of Jehovah’s Witnesses who were medically optimized and underwent revision THA. Databases from 2 institutions were reviewed to identify 10 patients (11 THAs) who were Jehovah’s Witnesses undergoing revision THA with a minimum 24-month follow-up. At most recent follow-up, all patients were doing well clinically, with Harris Hip Scores greater than 80 points. Radiographic evaluation demonstrated well-positioned components and no progressive radioluciencies. No major perioperative medical or surgical complications occurred in patients undergoing THA. Revision THA for aseptic causes results in good clinical outcomes in patients who are preoperatively optimized before undergoing surgery. Dr Harwin is from the Adult Reconstructive Service, Total Joint Replacement Bloodless Surgery Program, Beth Israel Medical Center, New York, New York; and Drs Pivec, Johnson, Naziri, and Mont are from the Rubin Institute for Advanced Orthopedics, Center for Joint Preservation and Replacement, Sinai Hospital of Baltimore, Baltimore, Maryland. Drs Harwin, Pivec, Johnson, Naziri, and Mont have no relevant financial relationships to disclose. Correspondence should be addressed to: Michael A. Mont, MD, Rubin Institute for Advanced Orthopedics, Center for Joint Preservation and Replacement, Sinai Hospital of Baltimore, 2401 W Belvedere Ave, Baltimore, MD 21215 (mmont@lifebridgehealth.org). Up to 10% of patients undergoing primary total hip arthroplasty (THA) will require a revision at some point in the future.1 In addition, the revision burden is projected to increase 137% in the coming 2 decades.2–4 Physicians will continue to care for patients who may differ from the general population’s demographics by virtue of medical circumstance or because of personal or religious choice. Whereas Christian Scientists by and large reject all conventional medical intervention, Jehovah’s Witnesses are receptive to medical care in general but oppose transfusions of whole blood or blood components (red blood cells, white blood cells, platelets, and plasma). In the approximately 7 decades since the adoption of this doctrine, published case reports regarding surgical outcomes and blood management strategies in the medical literature have spanned nearly every intervening decade.5–13 However, few reports have been published regarding revision THA in this subset of patients, and even fewer have systematically and objectively measured postoperative clinical outcomes. Because of the risks associated with perioperative blood loss resulting in postoperative anemia, physicians must be able to counsel their patients on expected outcomes using evidence-based data. However, many surgeons continue to be apprehensive regarding operating on patients who refuse blood transfusions for many procedures, including fractures, tumors, trauma, and elective primary and revision joint arthroplasty. With no option to transfuse, surgeons may speed up surgery or make intraoperative procedural changes to avoid prolonged blood loss. Therefore, this could result in less than optimal implant position and alignment. Short- and long-term outcomes may also be affected. For experienced surgeons and those familiar with blood salvage and conservation programs, revision surgery is not a contraindication in patients who are Jehovah’s Witnesses and must decline blood or blood product transfusions. To the authors’ knowledge, no studies have examined clinical outcomes outside of the immediate postoperative period. The purpose of this study was to observe (1) perioperative complications, (2) midterm clinical outcomes, (3) implant survivorship, and (4) radiographic outcomes in Jehovah’s Witnesses undergoing revision THA. This multicenter study identified all revision THAs performed in Jehovah’s Witnesses between 1998 and 2009 by 2 fellowship-trained surgeons specializing in revision surgery (S.F.H., M.A.M.). Ten patients (11 THAs) who met inclusion criteria were identified (Table 1). Three men and 7 women had a mean age of 67 years (range, 38–80 years) and mean follow-up of 69 months (range, 24–120 months). institutional review board approval was obtained for this study. Patients were included if they identified themselves as Jehovah’s Witnesses who had previously received a primary THA. Exclusion criteria included patients who did not identify themselves as Jehovah’s Witnesses or patients who did not undergo treatment with the comprehensive blood management protocol. One patient who was a Jehovah’s Witness was excluded for the latter reason. This patient was referred with massive periprosthetic infection with draining thigh and pelvic abscesses. He presented with sepsis and renal failure. He underwent urgent implant removal without the opportunity to optimize him preoperatively and died secondary to complications related to sepsis and renal failure, not postoperative anemia. Indications for revision surgery were a loose acetabular and femoral component due to osteolysis in 3 patients, a loose stem in 1 patient, a loose cup in 1 patient, polyethylene wear in 3 patients, and deep infections in 2 patients. The deep infections were treated with 2-stage revision. The patients were managed perioperatively based on an established blood management protocol (Figure 1). Preoperatively, patients were treated with erythropoietin (600 u/kg weekly for 3 weeks), iron (325 mg daily) and folate (1000 mg daily) to maximize red blood cell mass. Intraoperatively, all patients were placed under hypotensive anesthesia. Emphasis was placed on meticulous hemostasis and decreased surgical time. A closed-circuit Cell Saver device (Haemonetics, Braintree, Massachusetts) was used for all aseptic revisions. Postoperative care included re-infusion drains for all aseptic revisions and standard drains for septic revisions. Venous thromboembolism prophylaxis included mechanical sequential compressive devices and avoidance of pharmacological agents. Patients were mobilized postoperatively based on each institution’s physical therapy protocol. Figure 1: Flow chart of perioperative blood management strategies used for Jehovah’s Witness patients. Dosages used: erythropoietin (600 IU/kg intravenously [IV] per week for 21 days) and iron (25–100 mg IV daily), calculated as [dose=0.0442×(desired Hb−observed Hb) ×LBW+(0.26×LBW)], where Hb is hemoglobin and LBW is lean body weight. All patients also receive folate (1000 mg orally daily) and iron supplementation (325 mg orally daily). Pharmacologic deep venous thrombosis prophylaxis is avoided. *Pre-donation is not accepted by Jehovah’s Witnesses. Patients were followed at approximately 6 weeks, 3 and 6 months, 1 year, and annually thereafter. Range of motion and Harris Hip Score were recorded during each office visit. All implants were evaluated radiographically at each visit with anteroposterior and lateral radiographs of the hip. Radiographs were evaluated by identifying any progressive radiolucencies about the femoral or acetabular component, implant subsidence or migration, periprosthetic fracture, or component failure. Medical and surgical complications were identified. Medical complications included deep venous thrombosis, pulmonary embolism, cardiac arrhythmias, and renal failure. Surgical complications in the perioperative period included hematoma formation, superficial infection, and prolonged wound drainage. Postoperative complications included return to the operating room for polyethylene exchange, deep infection, periprosthetic fracture, and heterotopic ossification excision. All data were compiled and evaluated using an Excel spreadsheet (Microsoft, Redmond, Washington). No statistical analysis was necessary to evaluate the data. All patients seen at most recent follow-up were doing well clinically, with Harris Hip Scores greater than 80 points, and were all ambulating without assistive devices. No patient was lost to follow-up. Radiographic evaluation demonstrated no progressive radiolucencies, implant subsidence, or failure of any kind in any patient during the study period. No rerevisions were performed for septic or aseptic causes, including loosening, implant migration, implant failure, or pain. 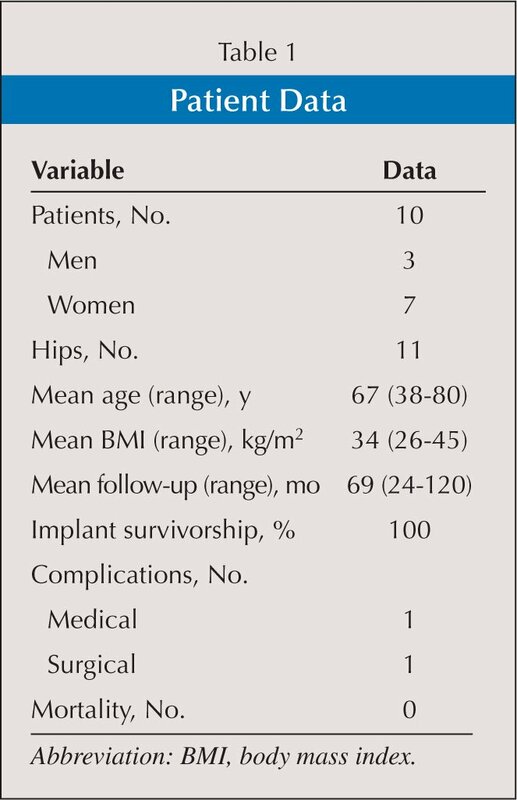 Implant survivorship at midterm follow-up was 100%. One medical complication, a deep vein thrombosis, occurred in the perioperative period and was treated with oral anticoagulation. Concurrent pulmonary embolism was ruled out with contrast-enhanced computed tomography. One surgical complication, a superficial wound infection, occurred and was treated with local debridement and a course of oral antibiotics. Both patients were doing well at most recent follow-up, with Harris Hip Scores more than 80 points. No mortalities occurred. In the setting of chronic infection, the standard of care is 2-stage revision THA with placement of an antibiotic spacer and treatment with parenteral antibiotics. The presence of bilateral periprosthetic infection increases the level of difficulty and, in patients who cannot accept blood transfusions, places increased emphasis on careful preoperative planning and medical optimization. The case of a patient with bilateral infected THAs is presented to illustrate the process by which patients who cannot be transfused can be safely and successfully treated with revision surgery. A 64-year-old woman was referred for treatment of a chronic bilateral periprosthetic infection. The patient had undergone staged bilateral primary THA in Guatemala 3 years prior. 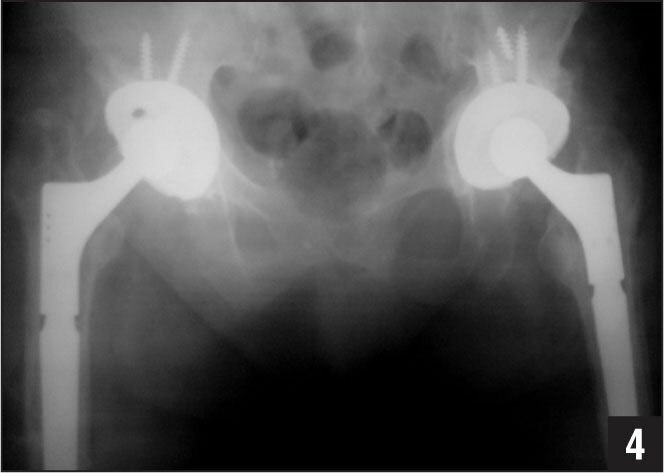 The implants used were a cemented Charnley-type prosthesis on the right hip and a proximally porous coated femoral stem with cement and a cementless cup with screws on the left hip (Figure 2). Figure 2: Preoperative anteroposterior radiograph of the pelvis with bilateral infected total hip arthroplasty, which was performed in Guatemala in a staged fashion 3 years prior to referral for infection. Two-stage revision THA for both hips was planned, which consisted of 4 separate surgeries over the course of approximately 1 year (3- to 4–month intervals between surgery). The patient was medically optimized prior to each surgical procedure. The first procedure was removal of the left prosthesis, followed by removal of the right prosthesis 3 months later (Figure 3). Approximately 6 months following the index procedure, the patient was infection free based on serological markers and underwent staged reimplantation. A cementless, modular femoral stem and cement-less cup with screws were implanted on the left hip. Approximately 3 months later, the patient was medically optimized and cleared for reimplantation of the right hip using the same components as the contralateral side (Figure 4). 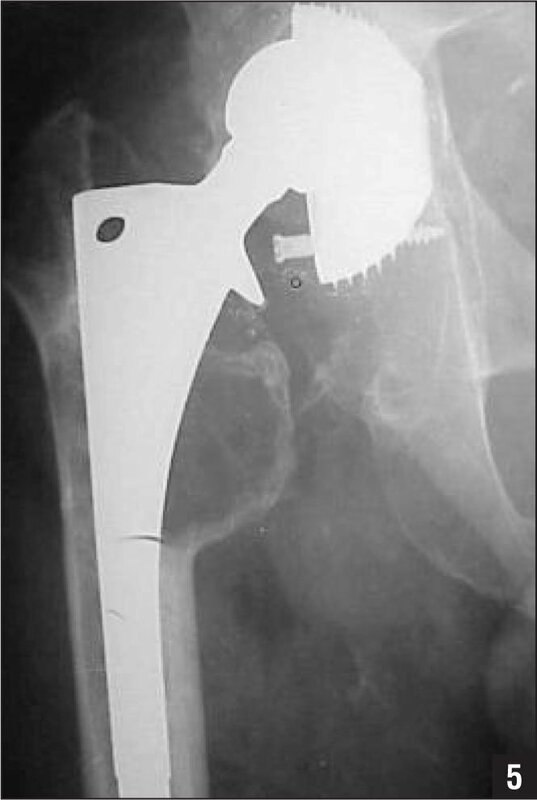 Figure 3: Anteroposterior radiograph of the pelvis showing interval removal of left and right prosthetic components. Figure 4: Anteroposterior radiograph of the pelvis demonstrating bilateral component reimplantation following successful infection eradication. At most recent follow-up, the patient was infection free, had returned to her prior activities of daily living, and was able to ambulate without the use of assistive devices. Radiographic assessment demonstrated good component alignment with no evidence of implant subsidence, migration, or failure. 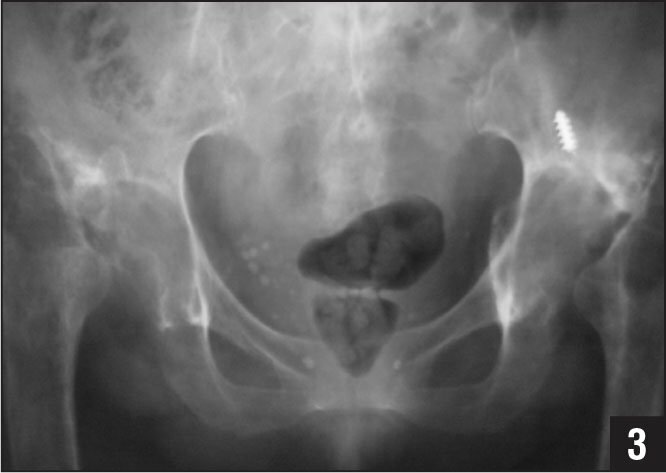 A 73-year-old man presented with right hip pain 12 years after cementless THA. Preoperative radiographs demonstrated massive osteolysis about the acetabular component and lesser trochanter with a soft tissue mass, loosening and migration of the cup, and severe eccentric polyethyelene wear (Figure 5). Workup for infection was negative. Following preoperative optimization, successful revision surgery was performed with debridement of several large periarticular granulomas (Figure 6) and acetabular component revision with a cementless cup and a posterior column screw. 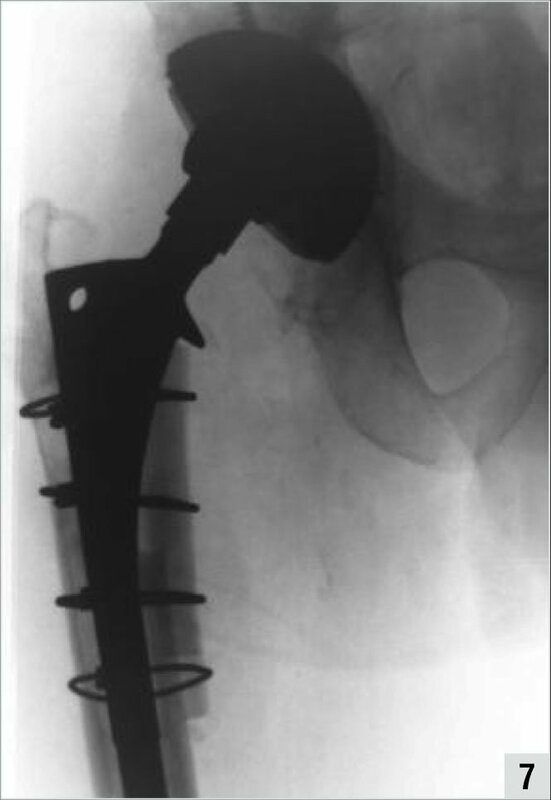 A new cobalt-chromium head and polyethylene liner were placed with retention of the femoral component, which was well fixed. Lesser trochanter osteolysis was management by placement of a medial cortical strut graft stabilized with cerclage cables (Figure 7). At most recent follow-up, 6 years postrevision, the patient had no significant pain and a Harris Hip Score of 85 points. Figure 5: Preoperative anteroposterior radiograph of the right hip demonstrating massive osteolysis, loosening and migration of the acetabular cup, and severe polyethyelene wear. 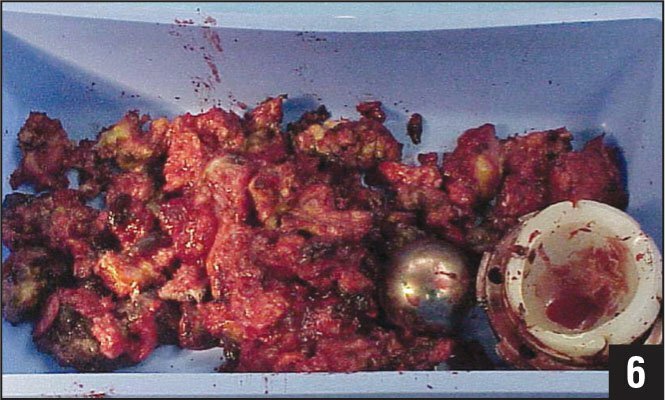 Figure 6: Intraoperative photograph of the excised massive granuloma, removed femoral head, and severely worn acetabular liner. Figure 7: Postoperative anteroposterior radiograph of the right hip showing revision of the loose acetabular cup, exchange of the femoral head and polyethylene liner, retention of the femoral component, and placement of a medial cortical strut graft. The goal of this study was to investigate the perioperative morbidities and midterm clinical outcomes of Jehovah’s Witnesses undergoing revision THA as measured by Harris Hip Scores, implant survivorship, radiographic outcomes, morbidity, and mortality. Previous studies have reported favorable outcomes of revision THAs in low-risk patients optimized for surgery. Although the current authors also observed similar outcomes to those reported in the literature following aseptic revisions in healthy, optimized patients, the risks of surgery must be carefully considered.9,10,12,39 The current authors believe that their comprehensive blood optimization and management program contributed to their excellent outcomes. The current study was limited in the number of patients available for analysis. Relatively few Jehovah’s Witnesses require revision THA, which makes comparisons of morbidity and mortality rates unreliable. Studies with greater power may better elucidate the relationship between mortality and revision surgery in this group, especially in the subgroup of patients with deep infections. Despite these limitations, the current study was able to objectively report clinical outcomes in a sizable number of Jehovah’s Witnesses with longer follow-up than has been previously published. In the largest study, Nelson and Bowen41 reported inpatient results of 100 patients with a mean age of 56 years (range, 13–86 years), including 24 patients undergoing revision THA. No mortalities occurred; however, comorbidities were not specifically mentioned, and all patients underwent extensive cardiac, pulmonary, and renal testing to determine whether they were candidates for hypotensive anesthesia.41 Similarly, Bonnett et al39 observed no deaths in 2 patients undergoing revision surgery in a series of 105 primary and 2 revision THAs. Sparling et al11 and Wittmann and Wittmann12,13 reported successful outcomes in a series of 5 healthy patients. However, Sparling et al’s11 patients were healthy (mean age, 66 years) and undergoing revision for aseptic causes. Patients with cardiovascular disease, hypertension, seizures, or occult blood loss were specifically excluded.11 The clinical circumstances of the patients described by Wittmann and Wittmann13 were unclear because comorbidities were not mentioned, and the only outcome reported was a mean postoperative hemoglobin of 7.2 g/dL. In contrast, a general study of revision THAs by Miller et al42 reported a 0.87% three-month mortality rate in 807 revision THAs performed between 1970 and 1996 in a community setting. Although recent studies of Jehovah’s Witnesses have demonstrated resilience to acute blood loss, postoperative anemia is closely associated with postoperative mortality. Animal studies have demonstrated tolerance of a hemoglobin concentration between 2 and 5 g/dL,8 with similar results in healthy human volunteers.21 In contrast, increased mortality is observed in patients who have intraoperative blood loss greater than 500 mL, with a 2.5-fold increase in mortality for every 1-g/dL drop in hemoglobin concentration below 8 g/dL.8,11,43 In a study of 300 surgical patients who refused transfusion and who had a hemoglobin concentration less than 8 g/dL, Carson et al43 reported 0% mortality with a hemoglobin concentration more than 7 g/dL, 34% with less than 5 g/dL, 54% with 2 to 3 g/dL, and 100% with less than 2 g/dL. In another study of 8787 hip fractures, Carson et al44 noted no mortality difference at 30 and 90 days postoperatively between transfused and nontransfused patients with a hemoglobin more than 8 g/dL. Although reports exist of patients surviving with a hemoglobin less than 1.5 g/dL,45,46 it is extremely rare because hemoglobin less than 3 g/dL approaches the lower limit of cardiac compensation to anemia.47 Similarly, increases in patient morbidity are also mirrored by a decrease in the hemoglobin concentration.43 Cognitive function declines at hemoglobin levels below 6 g/dL, and memory is impaired at hemoglobin levels below 5 g/dL.8,48 Smaller decreases in the hemoglobin concentration increase patient fatigue, which may affect physical therapy and delay hospital discharge.17 Thus, it is important to maintain hemoglobin levels to prevent rapid physical and mental decompensation, especially in elderly patients and those with multiple comorbidities. Revision THA is a viable treatment option for healthy Jehovah’s Witnesses who can be preoperatively optimized, although significant risks are associated with major surgery in patients who cannot accept blood transfusions. Although most Jehovah’s Witnesses can tolerate significant hemoglobin drops, at a certain hemoglobin concentration an inflection point exists where patients begin to rapidly deteriorate. It is imperative to plan for contingencies in the event of unexpected blood loss, which may include early termination of the procedure and completion in a staged fashion. A standardized blood management program presents treatment options. Patients should be medically optimized preoperatively, and measures should be taken to minimize intraoperative blood loss. Patients must be educated about transfusion alternatives and the higher risks associated with revision surgery. High-risk surgical patients with multiple medical comorbidities must be warned about the chances of prolonged hospitalization and the risk of death. However, if surgeons familiarize themselves with blood management treatment protocols and adequately evaluate and optimize patients preoperatively, surgery on Jehovah’s Witnesses can be performed safely with favorable clinical outcomes. Bourne RB, Maloney WJ, Wright JG. An AOA critical issue. The outcome of the outcomes movement. J Bone Joint Surg Am. 2004; 86(3):633–640. Blood transfusions; Jehovah’s Witnesses. J Am Med Assoc. 1957; 163(8):660–661. Panousis K, Rana B, Hunter J, Grigoris P. Rapid sequence quadruple joint replacement in a rheumatoid Jehovah’s Witness. Arch Orthop Trauma Surg. 2003; 123(2–3):128–131. Rab GT, Gorin LJ, Eisele JH. 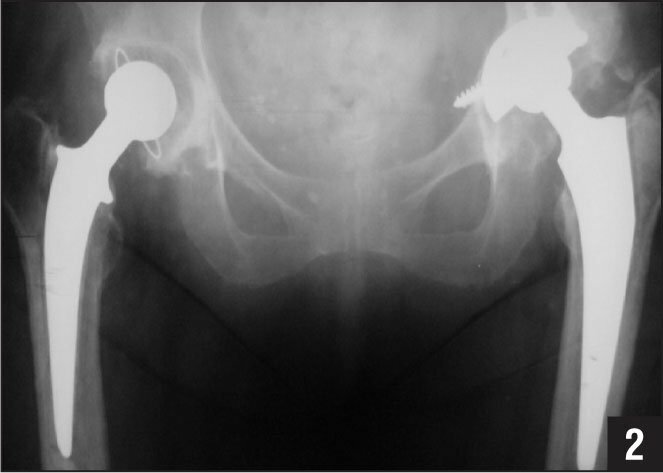 Bilateral total hip arthroplasty in a Jehovah’s Witness with chronic anemia. Clin Orthop Relat Res. 1982; (163):134–136. Sparling EA, Nelson CL, Lavender R, Smith J. The use of erythropoietin in the management of Jehovah’s Witnesses who have revision total hip arthroplasty. J Bone Joint Surg Am. 1996; 78(10):1548–1552. Woolson ST, Watt JM. Use of autologous blood in total hip replacement. A comprehensive program. J Bone Joint Surg Am. 1991; 73(1):76–80. Murkin JM, Shannon NA, Bourne RB, Rorabeck CH, Cruickshank M, Wyile G. Aprotinin decreases blood loss in patients undergoing revision or bilateral total hip arthroplasty. Anesth Analg. 1995; 80(2):343–348. Spence RK. Current concepts and issues in blood management. Orthopedics. 2004; 27(6 suppl):s643–s651. Eubanks JD. Antifibrinolytics in major orthopaedic surgery. J Am Acad Orthop Surg. 2010; 18(3):132–138. Keating EM, Meding JB. 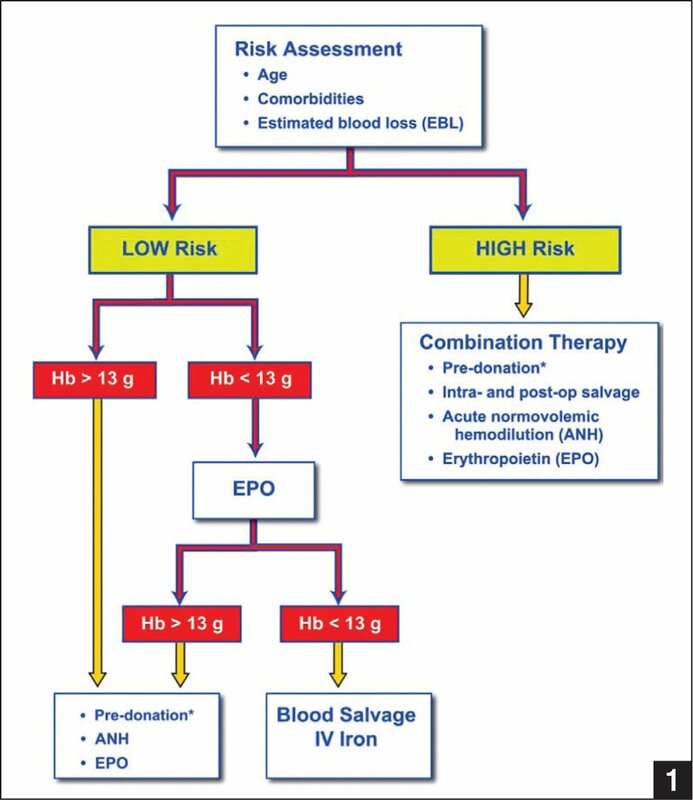 Perioperative blood management practices in elective orthopaedic surgery. J Am Acad Orthop Surg. 2002; 10(6):393–400. Marulanda GA, Krebs VE, Bierbaum BE, et al. Hemostasis using a bipolar sealer in primary unilateral total knee arthroplasty. Am J Orthop (Belle Mead NJ). 2009; 38(12):E179–E183. Singh J, Ballal MS, Mitchell P, Denn PG. Effects of tranexamic acid on blood loss during total hip arthroplasty. J Orthop Surg (Hong Kong). 2010; 18(3):282–286. Hack H., Mitchell V. Hypotensive anaesthesia. Br J Hosp Med.1996; 55(8):482–485. Jones HW, Savage L, White C, et al. Postoperative autologous blood salvage drains—are they useful in primary uncemented hip and knee arthroplasty? A prospective study of 186 cases. Acta Orthop Belg. 2004; 70(5):466–473. Bonnett CA, Lapin R, Docuyanan GB. Total hip replacement in Jehovah’s Witnesses under spinal anesthesia without transfusion. Orthop Rev. 1987; 16(1):43–47. Bourantas KL, Xenakis TA, Hatzimichael EC, Kontogeorgakos V, Beris AE. Perioperative use of recombinant human erythropoietin in Jehovah’s Witnesses. Haematologica. 2000; 85(4):444–445. Nelson CL, Bowen WS. Total hip arthroplasty in Jehovah’s Witnesses without blood transfusion. J Bone Joint Surg Am. 1986; 68(3):350–353. Miller KA, Callaghan JJ, Goetz DD, Johnston RC. Early postoperative mortality following total hip arthroplasty in a community setting: a single surgeon experience. Iowa Orthop J. 2003; 23:36–42. Current study 10 68 (38–80) 34 (26–45) 69 (24–120) 0 Preoperative eyrthropoietin, iron, folate. Hypotensive anesthesia. Cell saver for aseptic revisions.